If Artist is available, we will request that you go to our website of www.ontheroxentertainment.com (www.ontheroxent.com) and to fill out the formal booking request form. If Artist is not available we will ask you to select another Artist. If the offer is accepted then we will issue an booking agreement contract. 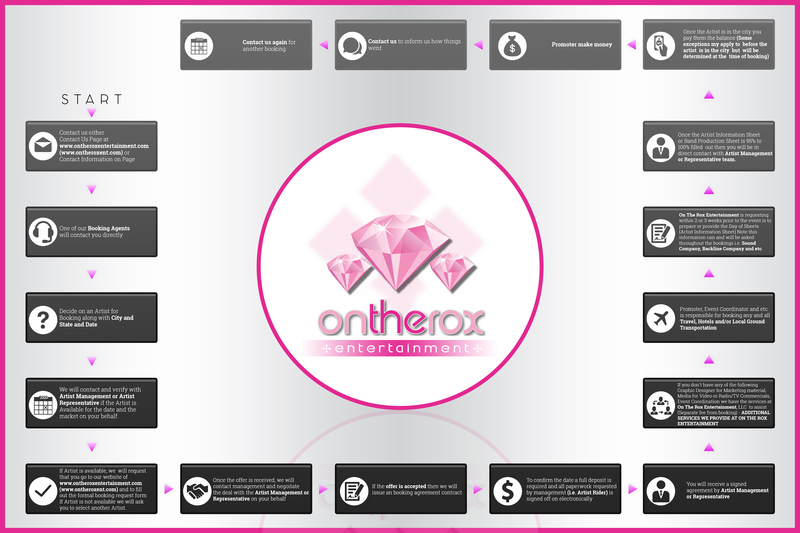 On The Rox Entertainment is requesting within 2 or 3 weeks prior to the event is to prepare or provide the Day of Sheets (Artist Information Sheet) Note this information can and will be asked throughout the bookings i.e. Sound Company, Backline Company and etc. Once the Artist Information Sheet or Band Production Sheet is 95% to 100% filled out then you will be in direct contact with Artist Management or Representative team.